I already wrote that since a few months ago I am working with #Anaconda, a scientific Python version, because this version includes several tools for working with data. 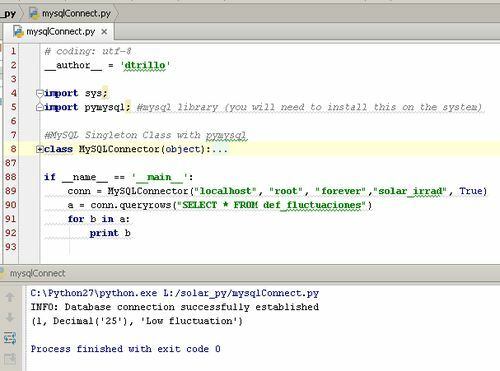 However, I ws a little bit confuse because there is no MySQL package to work with. 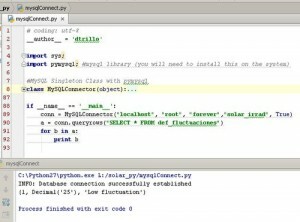 to work with PyMySQL, I have modify a class that I can use on several projects. The code is not main, but you can have it here, on GitHub. The source of this class is here, although I have introduce a few modifications, instead of working with config files inside the class. We instantiate to MySQLConnector object with the required parameters, we have the conection and … that’s it!